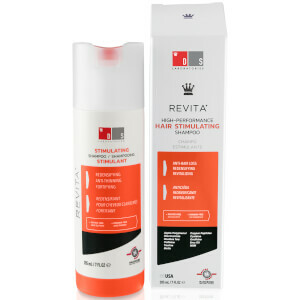 Treat thinning hair to the DS Laboratories Revita Shampoo; a daily, high-performance formula that works to cleanse, fortify and promote thicker, fuller-looking locks. Infused with a cocktail of beneficial ingredients, including Niacinamide, Caffeine and Rooibos Tea, the advanced formulation gently refreshes and revitalises hair, whilst delivering powerful stimulation to help maximise hair count. Hair feels longer and stronger with regular use. Apply to wet hair and leave on the scalp for 1-2 minutes before rinsing. Repeat and leave on the scalp for 3-5 minutes. Aqua/Water/Eau, Sodium Lauryl Sulfoacetate, Disodium Laureth Sulfosuccinate, Sodium Lauroyl Sarcosinate, Cocamidopropyl Hydroxysultaine, Cocamidopropylamine Oxide, Tetrasodium Edta, Sodium Cocoyl Isethionate, Peg-150 Distearate, Di-Ppg-2 Myreth-10 Adipate, Cocamide Mea, Glycol Distearate, Caffeine, Polysorbate 20, Citric Acid, Polyquaternium-10, Cinnamidopropyltrimonium Chloride, Emu Oil/Huile D’émeu/Dromiceius, Polyquaternium-70, Amodimethicone, C11-15 Pareth-7, Laureth-9, Trideceth-12, Glycerin, Hydrolyzed Soy Protein, Hydrolyzed Wheat Protein, Wheat Amino Acids, Ethylbisiminomethylguaiacol Manganese Chloride, Copper Tripeptide-1, Hydrolyzed Proanthocyanidin, Panax Ginseng Root Extract, Arginine, Acetyl Tyrosine, Arctium Majus Root Extract, Polyquaternium-11, Peg-12 Dimethicone, Biotin, Calcium Pantothenate, Zinc Gluconate, Niacinamide, Ornithine Hcl, Citrulline, Glucosamine Hcl, Alcohol Denat., Panthenyl Ethyl Ether, Inositol, Milk Protein/ Lactis Proteinum, Lactose, Acetyl Cysteine, Acetyl Methionine, Sodium Citrate, Taurine, Dimethyl Sulfone, Methylchloroisothiazolinone, Methylisothiazolinone, Magnesium Chloride, Magnesium Nitrate, Aspalathus Linearis Extract, Fragrance (Parfum), Benzyl Benzoate, Benzyl Cinnamate, Citronellol, Hexyl Cinnamal, Linalool , Butylphenyl Methylpropional , Red 4 (Ci 14700), Yellow 6 (Ci 15985).